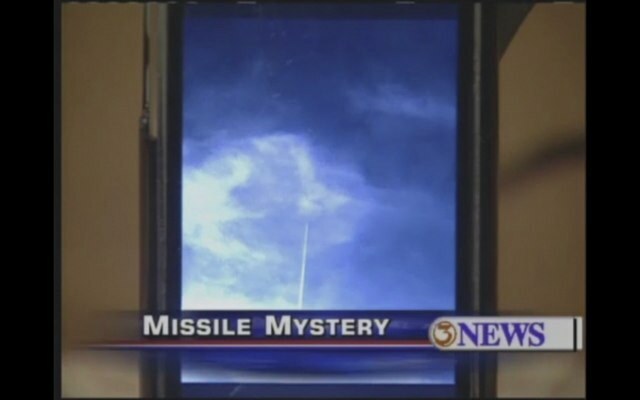 This must be the least missile-like mystery-missile ever. Taken Sunday, Jan 2nd, 2011, at “about three in the afternoon. 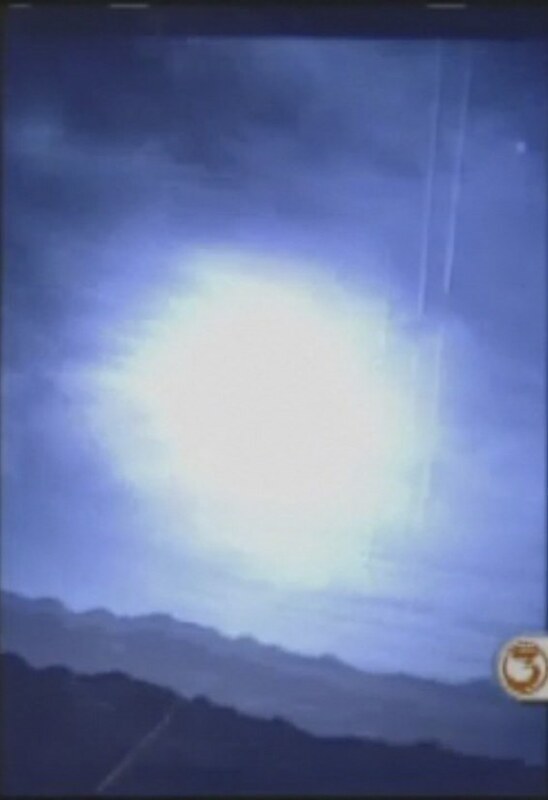 The video shows a jet contrail – barely moving relative to the clouds. It’s just a jet that happened to fly directly overhead, so the approaching contrail looks vertical. After showing the video, they go on to show some actual missiles, which look nothing like this as they zip into the sky at several thousand miles an hour. It’s not vertical any more that those power lines are at 45 degrees. It’s just flying overhead. And if you think it’s a missile, then first you need to explain what a jet leaving a contrail and flying straight towards you and directly over you would look like. It would look exactly like this. It’s amazing how the media can spin something so benign into “whatever you think”. It’s stories like these that totally reinforce my idea that modern media is almost completely useless. “some” believe? Some, as in the FAA, NASA, and NORAD, and anyone who actually looked into it? I don’t like to mock people, I make exceptions for the media. They are being stupid. Almost deliberately stupid, as if they recognize that the only way they can survive is to devolve into National Enquirer style entertainment reporting, where it truth is at best an unweildy foil. In the satellite image of the area (http://rapidfire.sci.gsfc.nasa.gov/subsets/?subset=USA6.2011002.aqua.250m), there is a faint spread contrail about 100 miles long above the land and pointing toward Padre Island. By the cloud shadows, the Sun azimuth is about 229 degrees, so this part of the image is taken at about 4:30 p.m., one hour and half after the event. You can see the time of the photo via “Display Metadata” on your link. Other distinguishable cloud shadows gave similar results. The azimuth values of 225 degrees correspond to 3 hours after the astronomical noon at the spot. Worst debunking story I have ever seen. I know that using some truth will help make a lie more palatable, but that is blatantly taking witness statements, ignoring them, and then making a seperate incident based on an image. 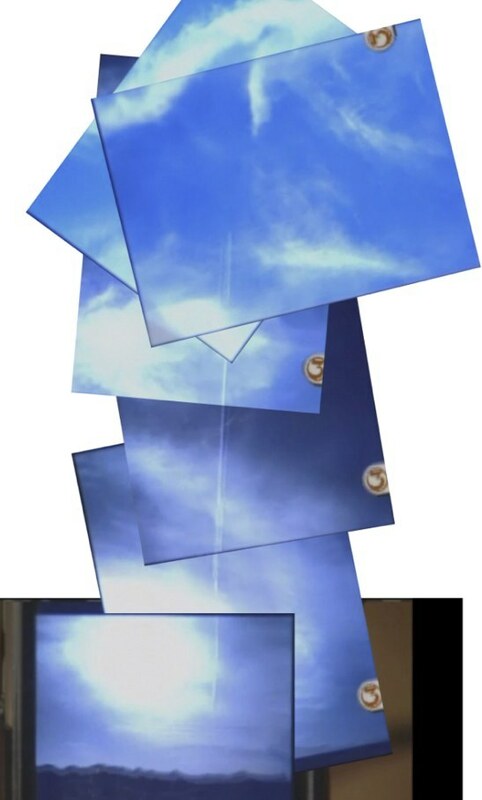 Yes, a 2D picture of a contrail going overhead will look like a missile launch because you can not see depth. That is why the people seeing it were amazed because they had depth perception seeing it go higher and not towards them. That is also why it seems to be going slowly, the higher an object goes, the slower it appears to be going because of distance ratios (missile is fast when launched, but in perspective with a hundred thousand miles of sky, it appears to be moving at a much slower rate). Come on, you guys can do better than that. If you don’t want to admit it is a missile, then attribute it to a model rocket enthusiast, or a slestak from land of the lost for all I care, but don’t attempt to be an intelligent debunker with little logic. It insults everyone. As for the perceived speed of the “object”, it might well have been increased by a movement in the opposite direction of the clouds below . But this is hardly possible to make out from the shaking video. 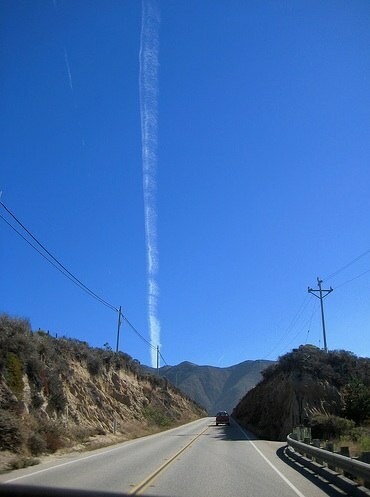 That’s why people mistakenly think that the contrails are casting shadows upwards all the time. Or why people mistake Jupiter/Venus for incoming planes/ufos. Because you can’t see depth directly via parallax at that distance. I can’t wait to get video of the ‘missile’ I see being launched every day at 7am. The fact that it’s being ‘launched’ from what looks like Montreal makes it that much more hilarious. Love it, that was a little better….The addition of the extra clips helps a lot, but at 23, 24, and 26 seconds into the original video, you can see the line going down to the horizon. The unfortunate part of this is the fact that this is a video phone, and as you look at each section, the glare of the sun actually causes false images. at 28 seconds, it even shows that the path is directly in the sun’s glare. As you watch frame by frame, it shows the faulty camera by lines appearing and disappearing due to having the sun in the background and the processor trying to interpret what it is seeing. As for the depth perception issue, the argument is not about depth perception by the people there; it is about using a picture (2D) to argue against what was seen by the people there who can percieve depth. Again, you’re trying to pull the argument away from the corroborating witnesses to someone not there comparing two different 2 dimensional pictures with no reference points. Lastly, for facts, there was a representative from the Naval Air Station on record stated that he saw it and did not have any idea what it was. HMMMM! But they don’t know how to percieve things going through the sky like us normal educated civilians, they just have to rely on it to save our lives. Jason: and your positing that people can see depth and accurately judge distances of things miles away, when it’s consistantly proved that they can not. For everyone’s info, It goes back to me not really being bothered by it no matter what it is. I just think that the grasping at arguable facts does not help the situation. Looking at the quick response from you guys tells me that your knee jerk reaction is that there would/could never be a missile launch here, so the approach to disprove was clouded by the belief that it was false in the first place. Take facts and then use those facts to make a decision, not make a decision and then give facts to support. Now, if you were to actually try to disuade people, don’t use so many facts that everyone can look at, people want to grasp on to general ideas like “a local rocket enthusiast, since that does not have the telltale signature of a large rocket going through the sky”. Easy explanation, and keeps everyone relaxed, and guess what…it makes the most sense to those that saw it also. I don’t see the line going down to the horizon. Give a screenshot of the trails reaching the ground. Here’s the closest I could get (double contrails is video artefact). Note there is a GAP in the contrail. One does not see gaps in missile trails. And where is this missile? They are looking towards Mexico. I appreciate your comments also Dmitri. Most of what I say is “tongue in cheek”, but taking venus at night in a relatively stable position and a moving target relative to a fixed position during the daylight is quite a bit different. Is good discussion though, and I appreciate that. Easy explanation, and keeps everyone relaxed, and guess what…it makes the most sense to those that saw it also. Jason, the point of debunking something is not to put people’s mind at rest. It’s to expose false claims, and to try to approach the actual truth. What actually happened here? It looks exactly like a jet contrail travelling towards Texas from the South West. That explanation fits the facts by far the best. Especially as so many other jet contrails have been mistaken for missiles. I like the collage of screenshots in the update. At the time and date the sun altitude was about 30 degrees. By the end of the video the trail seems to pass the zenith, that explains the mobile phone camera turning upside down. If it were a better camera with a x10 optical zoom, it would have resolved the plane flying overhead. 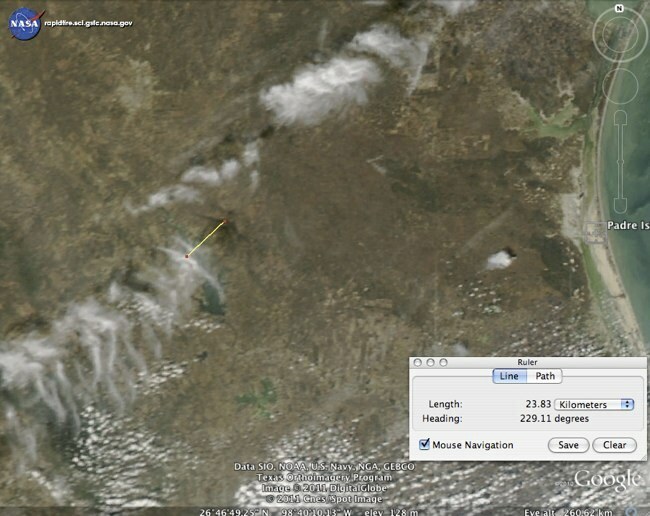 As Uncinus corrected me, the above satellite image of this area, showing a faint long contrail, was probably taken more than one hour before the event. 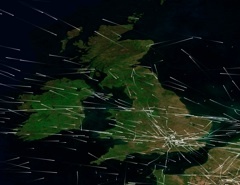 Still, it suggests that the atmospheric conditions south-west of the spot were right for the formation of very long contrails and, if there was another plane flying in the same direction, it could have produced the observed trail. Witness statements need to be examined to actual content – merely taking them at face value is not a very good thing to do in any circumstance as many courts of appeal have found – IIRC Texas just released a guy after 30 years in jail based upon identification by the victim – you can’t be much closer as a witness than that – when DNA proved she was 100% wrong. Certainly people see something – when they describe the characteristics of what htey see that is usually accurate – when they describe what it is they think they are seeing then they are often wrong – a long white trail across the sky – fine – a factual description that no-one is going to argue with. A top secret operation praying the atmosphere with barium or aluminium or mind control drugs? Derived conclusion for which I’d still like to see any verifiable evidence at all, and until I do I’m going to say it’s unsupportable supposition for which there is a great deal of verifiable evidence that shows it is false. and at least there _is_ some truth in the debunking – there is none at all in the hoax. Haha. Lets see when this notice apears in spanish and latin alternative media. By now they are bussy with the fishes and the birds. Uncinus. I came by here as Casual Observer a few times. Linking your site to my blog, bro. Keep up the excellent work. hooah! There is no evidence that will convince a determined conspiracy theorist. Your responses were both evidence-based and respectful of the urge to investigate, while clearly defining what qualifies as scientific evidence…. and what does not. It’s a thankless and never-ending task, but a necessary one — scientific illiteracy masquerading as fact should never stand unchallenged. The evidence-blind conspiracy theorist won’t be persuaded, but it’s an invaluable service for any and all who might someday stumble onto that page, like I did. Good job. A. The user banning Uncinus. B. Post in all caps. Although I did see the term “government shill” from someone, so I’m glad to see the posters aren’t losing all of their ignorant habits. They would be better off buying a decent tripod. Really hate the shaky videos. Still, the “courageous skywatcher” part makes me smile.